Have you ever eaten a Jennie-O Turkey Burger? Are they good?? 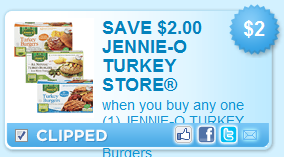 Grab this $2.00 off Jennie-O Turkey Frozen Burgers coupon. It will go fast – especially with the Super Bowl coming up. Found under zip code 53027, 3rd page of Food category. You can usually print each coupon twice per computer! Print quickly - they may go fast!